Physical and Mental soundness is crucial to a dog being able to perform in Conformation, Obedience, Agility, Field and normal family activities. I strive to produce good natured, out going dogs that are eager to please and are not aggressive towards children or other dogs. All breeding stock is OFA certified to be clear of Hip Dysplasia, Genetic Thyroid Disease, and PRA/CLAD. All pups are raised on a program of sound nutrition with regular vaccinations and wormings. All pups will have dew claws removed, be microchipped, and vet checked. Natural Hunting Instincts are strongly bred into our pups and encouraged from a very early age. At 5 weeks of age pups start pointing a game bird wing on a fishing pole; at 6 weeks they have their first live birds: pigeons or quail. All pups are born in a home bedroom and raised there until they are 3 – 4 weeks old. They are then moved into the kitchen where they become accustomed to normal household noises, other adult dogs, and a number of people of all ages. Table training for grooming and showing begins by 4 weeks, and the pups are exposed to toenail and hair clippers. They have a great variety of toys and are presented with different levels, surfaces, and textures. They have a large outside play area and go for regular runs in our yard starting at 5 – 6 weeks of age. 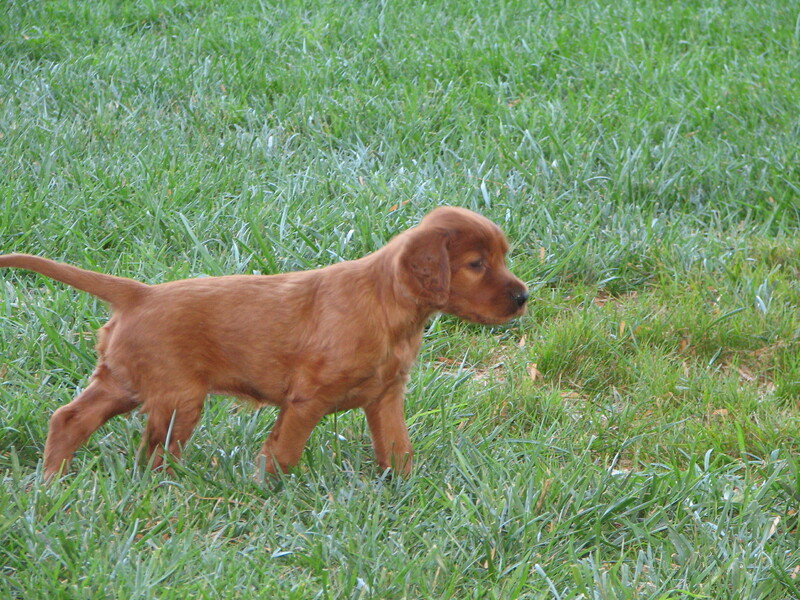 All puppies are graded for Conformation Soundness, Temperament, and Hunting Instincts at 6 and 9 weeks of age. This allows us to place each pup in the best environment for its natural abilities.